During the 1960s and 1970s the Society was involved in archaeological investigations on the following local sites threatened by development. Most of the excavations were reported in our quarterly Bulletin, or in Surrey Archaeological Society’s Bulletin, and are considered in more depth in the relevant volume of Mitcham Histories, as listed on the right. The Short Batsworth excavation has now been published, but no other formal reports have been published. 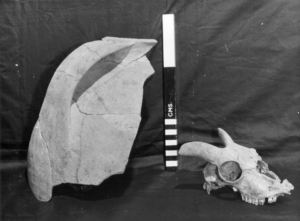 Above: Fragment of a medieval pitcher and the skull of a horned sheep, from excavations conducted in 1970 to the rear of P Gutteridge and Sons’ former shop. The finds are all boxed, labelled and partially indexed and, together with site notes and photographs, have been deposited at the London Archaeological Archive and Research Centre, 46 Eagle Wharf Road, London, N1 7ED. 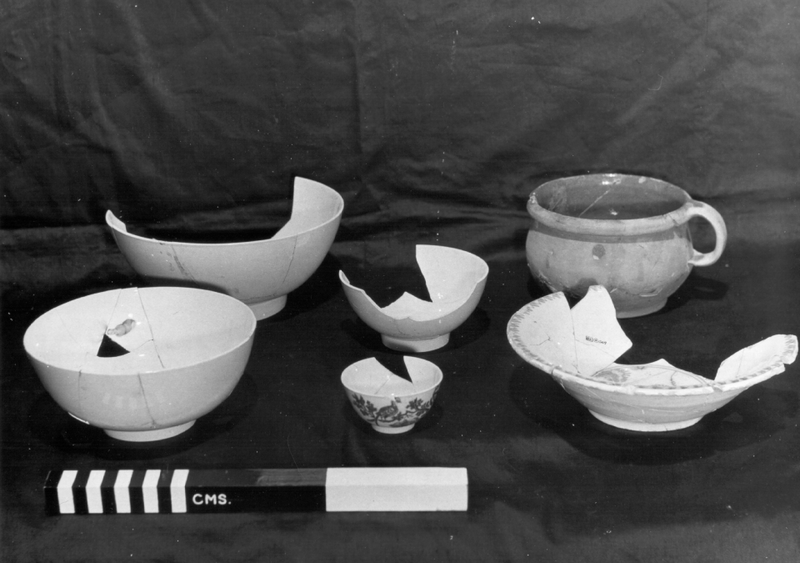 Left: Mid-18th-century pottery from the excavations at the rear of P Gutteridge and Sons’ premises in 1970. This entry was posted in Resources, Excavations, Resources and tagged in excavation.